There are all sorts of excellent fence options available today! Are you considering installing a fence around your property? A fence can be an excellent addition to your outdoor landscape. It can provide the property owner with privacy, security, and aesthetics. However, there is a lot to consider when it comes to getting a fence for your property. 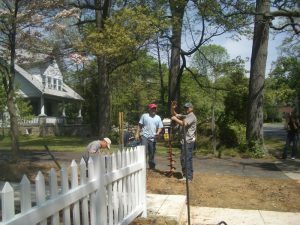 Here are a few things every homeowner should know about installing a fence! Your first step in this whole fence process is to ensure you are crystal clear of the property lines. It would be a total shame if you realized you exceeded your boundaries when you had your fence installed. This can easier be prevented if you double-check ahead of time. It worth taking some time to consult your next door neighbors to make sure you are both on the same page in regards to where the property lines fall. It is also a good thing to know if you plan on doing any landscaping in the future. This is where many fence owners go wrong. You need to allow your fence to dry out after it is installed. The manufacturer applies all sorts of finishes and moistures to the fence. If you try to paint or stain your fence before it is completely dry, it may not be absorbed by the wood. For this reason, don’t rush to get your fenced painted or stained after it is installed because it should help the longevity of the fence. An ugly exterior to your fence can lead to unhappy next door neighbors. It is recommended that the nice side of your fence faces your neighbors. If it is the other way around and the integrity of your fence faces the neighbors they are probably not going to be very pleased with you. This entry was posted on Friday, September 29th, 2017 at 5:10 pm. Both comments and pings are currently closed.